Computer scientists are developing new adaptive mobile technology which could enable blind and visually-impaired people to 'see' through their smartphone or tablet. Project lead Dr Nicola Bellotto, an expert on machine perception and human-centred robotics from Lincoln's School of Computer Science, said: "This project will build on our previous research to create an interface that can be used to help people with visual impairments. "There are many visual aids already available, from guide dogs to cameras and wearable sensors. Typical problems with the latter are usability and acceptability. 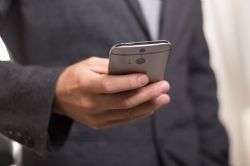 If people were able to use technology embedded in devices such as smartphones, it would not require them to wear extra equipment which could make them feel self-conscious. There are also existing smartphone apps that are able to, for example, recognise an object or speak text to describe places. But the sensors embedded in the device are still not fully exploited. We aim to create a system with 'human-in-the-loop' that provides good localisation relevant to visually impaired users and, most importantly, that understands how people observe and recognise particular features of their environment." A key aspect of the system will be its capacity to adapt to individual users' experiences, modifying the guidance it provides as the machine 'learns' from its landscape and from the human interaction. So, as the user becomes more accustomed to the technology, the quicker and easier it would be to identify the environment.